RIVERSIDE, Calif. – Drought-tolerant crops have moved closer to becoming reality. A collaborative team of scientists has made a significant advance on the discovery last year by the University of California, Riverside’s Sean Cutler of pyrabactin, a synthetic chemical that mimics a naturally produced stress hormone in plants to help them cope with drought conditions. 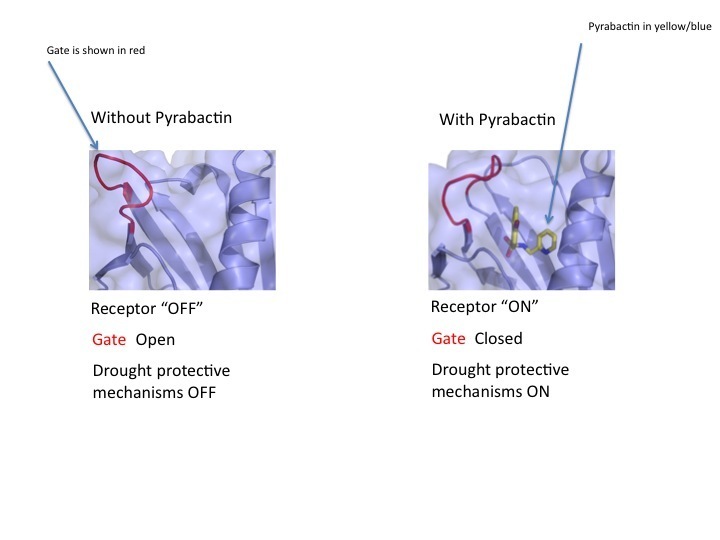 Led by researchers at The Medical College of Wisconsin, the scientists report in Nature Structural & Molecular Biology (online) on Aug. 22 that by understanding how pyrabactin works, other more effective chemicals for bringing drought-resistance to plants can be developed more readily. Plants naturally produced a stress hormone, abscisic acid (ABA), in modest amounts to help them survive drought by inhibiting growth. ABA has already been commercialized for agricultural use. But it has at least two disadvantages: it is light-sensitive and costly to make. Pyrabactin, on the other hand, is relatively inexpensive, easy to make, and not sensitive to light. But its drawback is that, unlike ABA, it does not turn on all the “receptors” in the plant that need to be activated for drought-tolerance to fully take hold. Each receptor is equipped with a pocket, akin to a padlock, in which a chemical, like pyrabactin, can dock into, operating like a key. Even though the receptor pockets appear to be fairly similar in structure, subtle differences distinguish a pocket from its peers. The result is that while ABA, a product of evolution, can fit neatly in any of these pockets, pyrabactin is less successful. Still, pyrabactin, by being partially effective (it works better on seeds than on plant parts), serves as a leading molecule for devising new chemicals for controlling stress tolerance in plants. Cutler explained that each receptor is equipped with a lid that operates like a gate. For the receptor to be activated, the lid must remain closed. 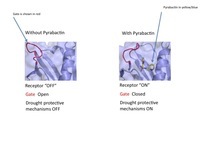 Pyrabactin is effective at closing the gate on some receptors, turning them on, but cannot close the gate on others. The researchers have now cracked the molecular basis of this behavior. “A key insight from the current work is that this difference is controlled by subtle differences between the receptors in their binding pockets,” said Cutler, an associate professor of plant cell biology in the Department of Botany and Plant Sciences and one of the members of the research team. He explained that in a receptor where the gate closes, pyrabactin fits in snugly to allow the gate to close. In a receptor not activated by pyrabactin, the chemical binds in a way that prevents the gate from closing and activating the receptor. “These insights suggest new strategies for modifying pyrabactin and related compounds so that they fit properly into the pockets of other receptors,” Cutler said. According to Cutler, pyrabactin has paved the way for manufacturing new molecules that activate or turn on receptors. The discovery of pyrabactin by the Cutler lab was heralded as a breakthrough research of 2009 by Science magazine. In the current research, Cutler collaborated with Brian Volkman and his research group at the Medical College of Wisconsin, and helped guide critical questions. A grant from the National Science Foundation supported Cutler’s contribution to the study. Cutler and Volkman were joined in the study by Francis C. Peterson (first author of the research paper), Davin R. Jensen and Joshua J. Weiner of the Medical College of Wisconsin; Sethe Burgie, Craig A. Bingman and George N. Phillips, Jr. of the University of Wisconsin-Madison; and Sang-Youl Park and Chia-En Chang of UCR. Cutler is a coauthor also on a companion paper, titled “Identification and Mechanism of ABA Receptor Antagonism,” that appears online Aug. 22 in Nature Structural & Molecular Biology. He joins the following researchers in that study: Karsten Melcher (first author), Yong Xu, Ley-Moy Ng, X. Edward Zhou, Fen-Fen Soon, Kelly M. Suino-Powell, Amanda Kovach, Jun Li and H. Eric Xu of the Van Andel Research Institute, Grand Rapids, Mich.; Eu-Leong Yong of the National University of Singapore; and Viswanathan Chinnusamy, Fook S. Tham, and Jian-Kang Zhu of UCR. 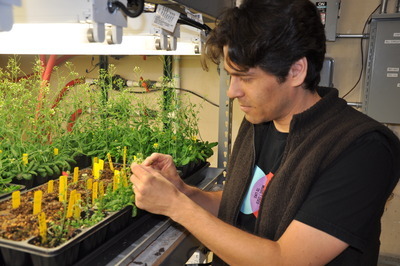 Sean Cutler, an associate professor of plant cell biology at UC Riverside, at work in the lab. Photo credit: UCR Strategic Communications.